The article is titled, “Michael Cohen Reminded Us Why Trump’s Birtherism Matters” and invokes Trump’s demand, voiced early in 2011, that the White House release proof that Obama was born in the United States and was therefore presumably eligible to the office of president, to demonstrate Trump’s alleged racism. 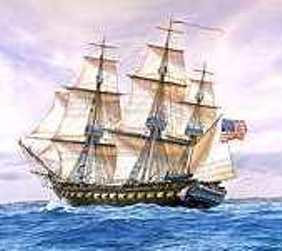 Article II, Section 1, clause 5 of the U.S. Constitution requires that the president and commander-in-chief be a “natural born Citizen.” While much controversy has ensued over more than a century as to the exact meaning of the term as intended by the Framers, nearly all Americans understand that a person born outside the United States and later naturalized as a U.S. citizen cannot serve as president. Some reportage during Barack Obama’s first presidential campaign suggested he was “an immigrant” to the U.S. amid a myriad of contradictory reports as to his place of birth and citizenship status which were never reconciled. For a number of years, and contrary to a number of credible news reports as well as a 1991 biography released by Obama’s first literary agent, Obama has claimed he was born in Honolulu, HI on August 4, 1961 at the Kapiolani Medical Center for Women & Children. In the early stages of his 2008 presidential campaign, at least three sources reported him as having been born at Queen’s Medical Center in Honolulu, with some later amending their reports to say he was born at Kapiolani. 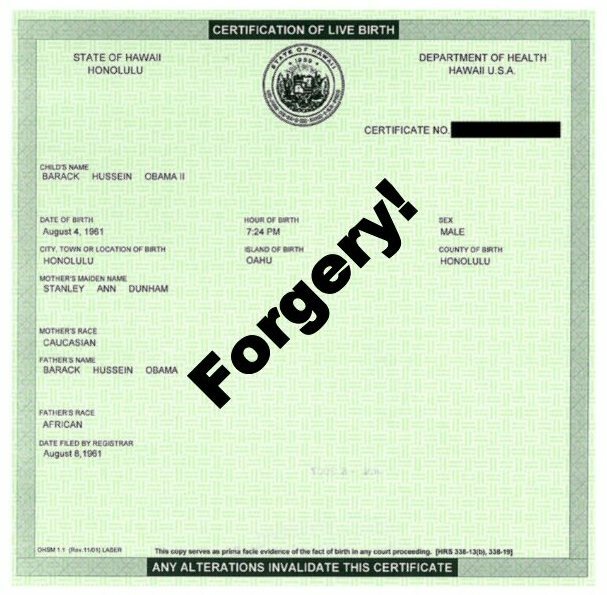 As Bauer noted in his article, he was White House counsel when an alleged “long-form” birth certificate image, reportedly obtained in the form of two certified copies by Judith Corley, Obama’s personal lawyer and also of Perkins Coie, from the Hawaii Department of Health (HDOH) on April 27, 2011. The event was widely reported by the mainstream media. During a press conference following the release of the image, Obama stated that the White House had “provided additional information today about the site of my birth.” He did not hold a document in his hand, nor was one displayed in the background or held by anyone else as he spoke. I noted that Bauer in his article put great weight and emphasis on the earlier released short-form CERTIFICATION of Live Birth document. That document was only shown in June 2008 to the general public as a computer image. It was also proven to be a computer generated forgery. That statement by Bauer is interesting since to my knowledge Hawaii officials have never validated in any way the short-form document or the image of it shown online in June 2008 … nor have they even ever stated or verified that they issued a short-form CERTIFICATION of Live Birth document to Obama or his attorneys or agents in the spring of 2008, as was claimed by Obama as to when he got it. When one’s story is a lie, as is Obama’s early life narrative and which is parroted by his various Consigliere, it is very hard to keep all the claimed “facts” in agreement over time. This has happened with Obama statements time and time again. Bauer is now claiming that the original forged short-form CERTIFICATION of Live Birth form released in June 2008 is more official and important than is the long-form CERTIFICATE of Live Birth released in April 2011. That in itself, over and beyond the images being computer generated forged images, is an untruth unto itself. Barack Hussein Obama II may or may not be “born a Citizen” of the United States depending on what the 1961 contemporaneous birth registration documents sealed in Hawaii reveal. And Americans have good reason to be greatly concerned about the truth as to where he was physically born as opposed to where his birth may have been falsely registered by his maternal grandmother as occurring in Hawaii as this Catalog of Evidence details. But he can never be a “natural born Citizen” of the United States since his father was a foreigner, a British Subject who was never a U.S. Citizen and was not even an immigrant to the USA. Since his father was a British Subject and not a U.S. Citizen when Obama was born, Obama was born a British Subject. The founders and framers are probably rolling over in their graves knowing this person was sworn in as the putative President and Commander of our military. Adjectives mean something. Especially in terms in the Constitution and must not be ignored. 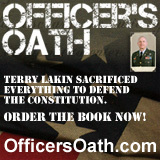 Only a “natural born Citizen” can be the President of the USA and Commander in Chief of our military. Obama is not a natural born Citizen of the USA and is thus constitutionally not eligible (to constitutional standards) to serve as President and Commander in Chief of the military. … Neither Comey, McCabe nor anyone at the FBI has ever issued a statement about the forgery of a document belonging to the then-sitting [defacto] President of the United States [Obama] who was credibly reported, before and after his first presidential run, to have been born outside of the country, which would have placed his eligibility in question. Perhaps ironically, Guthrie is the sole reporter to have claimed that on April 27, 2011, she “felt the raised seal” on the copy of the Obama long-form she purportedly received. Photos she reportedly took of the seal and posted on social media are no longer available. Zullo has said, however, that a reporter in the off-the-record session with Bauer correctly noted that no “original” birth certificate was shown to reporters. 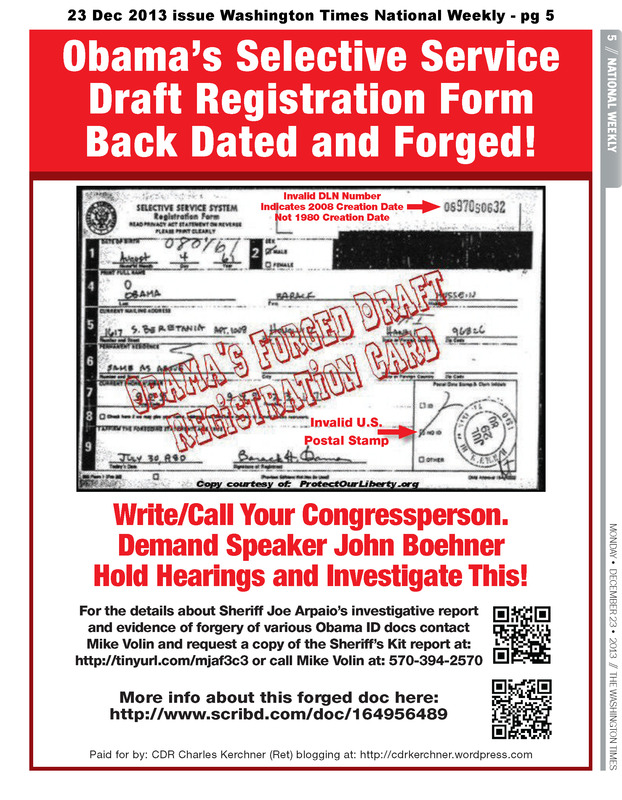 Early in the investigation, Zullo revealed that not only was the long-form image found to be fraudulent, but also Obama’s purported Selective Service registration form, an issue which then-Selective Service System Director Lawrence Romo suggested be presented to the FBI if Arpaio believed a crime had been committed. 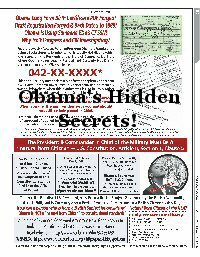 Barack Hussein Obama II may or may not be a “born Citizen” of the United States depending on what the 1961 contemporaneous birth registration documents sealed in Hawaii reveal. And Americans have good reason to be greatly concerned about the truth as to where he was physically born as opposed to where his birth may have been falsely registered by his maternal grandmother as occurring in Hawaii as this Catalog of Evidence details. But he can never be a “natural born Citizen” of the United States since his father was a foreigner, a British Subject who was never a U.S. Citizen and was not even an immigrant to the USA. Since his father was a British Subject and not a U.S. Citizen when Obama was born, Obama was born a British Subject. The founders and framers are probably rolling over in their graves knowing this person was sworn in as the putative President and Commander of our military. Adjectives mean something. Especially in terms in the Constitution and must not be ignored.